The Rotary Duck Derby has become one of Josephine County’s most important fund-raising efforts, bringing in more than $1.3 million to help the county’s children. 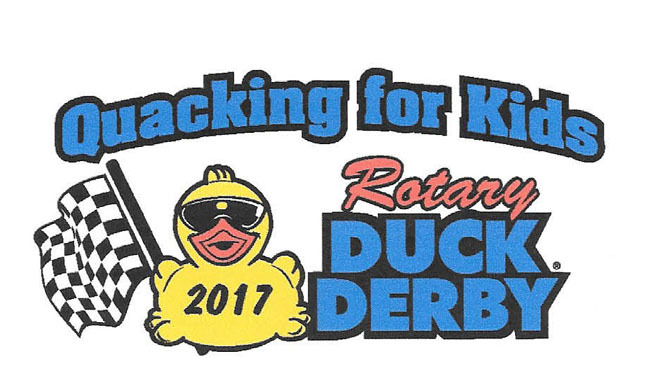 Rotarians and retail outlets sell duck “adoptions” for $10 per race entry and generous sponsors pay the cost of the race itself, so the maximum amount of proceeds can go to the cause. Ducks are adopted from July to mid-September, when the race itself is held. Adopted ducks are dumped into the Rogue River from the Grants Pass Parkway and float down to Riverside Park. The first dozen or so ducks reaching the trap win their adopters a prize, with the current grand prize being $15,000 toward purchase or lease of a car from one of Grants Pass’ five new car dealers. The proceeds from the 2017 race were split between 4-H, for new, badly needed livestock pens, and a parks foundation, to put a “sprayground” in Riverside Park’. ln its 14 years, the Rotary Duck Derby has paid for development of Morrison Park in Grants Pass, construction of all-weather tracks at the four public high schools, building of a new Josephine County Food Bank storehouse, teen centers at the Boys & Girls Club and a covered amphitheater at Wildlife lmages. Copyright © 2019 grantspassrotary. Powered by WordPress and Stargazer.